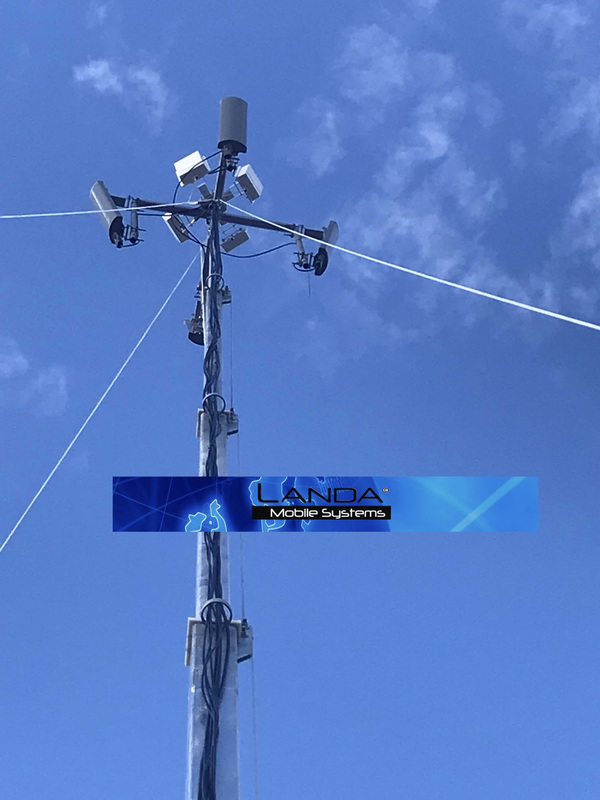 The Landa mobile systems remote data & cellular solution provides a 3×3 redundancy for your remote connectivity needs. The centerpiece of the solutions is a private Cellular LTE and 3G Metro cell unit with authentication for the use of only your devices “AT&T only”. This solution can provide up to 25mb x 3 mb of internet access using the new gen-5 satellite and up to 4 dishes can be setup for a combined bandwidth of up to 100mb x 12 mb of internet service. The solution also provides a high-powered Wi-Fi backup solution that offers four 90° sectors antennas with 2 watt radios per antenna. The final part of the solution is a high-powered cellular repeater with Yagi antennas to act as a back haul to connect to a cell towers up to 25 miles away to provide service locally. All the solutions can run simultaneously with auto fail-over and can be deployed in a matter of minutes. This is a true remote data solution for all your data and voice needs, for those true remote deployments this solution can also be outfit with solar power as well. Added cradle point with AT&T and Verizon. No monthly service fees with carrier. Currently deployed at the Louisiana state fair. Setup in 20 minutes and on the air. We can also configure the unit with 4 solar panels built in. LMS tower construction begins in our R&D department, where we take our concepts through the design, prototype, engineering, testing, validate, and patent our documented product lines. All LMS towers are designed to meet stringent and unique requirements of our clients both domestic and abroad. GVWR is 7000 lbs. trailer weighs 3605 lbs… usable 3395 lbs. Complete trailer primed with inorganic zinc conforming to MDDOD-P-23236A, Coated with an epoxy polyamide coat conforming to MS MILL-P2441 formula 150 and urethane top coat conforming L-P MS MILL-C-85285. All tower assembly hardware is galvanized or eco HCF green coated for stand alone corrosion resistance. Landa Mobile Systems meets or exceed process and testing in Low Temperature in accordance with Mil-Std-810 Procedure II : Operational cold start and/or Storage, High Temperature in accordance will Mil-Std-810 procedure I with solar loading., Salt Fog or Humidity in accordance with Mil-Std-810 Method 507.4 . Blowing Rain in accordance with Mil-Std-810 method 506.4, Blowing Sand and dust – In accordance with Mil-Std-810 method 510.4 procedure II., Transport shock, Transport vibration, Military Trans-portability Testing, Meets DOT specs., Shock and vib test for ruggedness Mil-810., Height & Weight distribution testing, Braking & Handling, Grading/Slope @ 10-30%, Steering & Handling, Turning diameter, Static roll-over, Stability & Handling, Towing compatibility. Certified Green Gin Poles are manufactured 100% from USA recycled steel. Facility AWS D1.1 Certified, and 100% US Certified Welders welding to AWS, Certified 100% (AWS) D1.1 independent contractor inspected before leaving our facility. Towers are 100% hot dipped galvanized finished to EN ISO 1461/ASTM A123/CSA G164 and ANSI/EIA-TIA-222 G, per section 107 and CSA S37 standards. Steel is ASTM A500, grade B/C. All products manufactured are Engineered and warranted. We have become the finest manufacturer of Gin Poles, Portable Towers, Climber Training Towers, Oil and Gas Flare Towers and Portable Shelters in the Americas, thanks to team efforts and most important our customer support. “Service disabled veteran owned company built in America by Americans.” Minority owner and plant located in HUB zone. Support our efforts as we support your freedom.